Power to decide is an either/or proposition. Two groups don’t have power to make the same decision, at the same time, in the same way. When managers and front-line employees “pretend-collaborate,” for example, the group that makes the decision has the power. Power and authority are zero sum games – the degree that one group gains decision-making power is the degree that another group loses it. When it comes to power, there are gainers and losers. Empowering another is losing your power. where managers won’t give up power. Preaching empowerment and hanging on to power, at the same time, is manipulation. It’s a way to make people think they have power so they’ll go along and work harder. Empowerment demands transparency. Those making decisions must have information. If you can’t or won’t share information, you can’t empower. Empowered organizations have fewer managers. Flat organizations inevitably fire managers. Managers only play at empowerment because they’re protecting their jobs. Empowerment requires radical preparation. You aren’t disempowered one day and empowered the next. The workforce needs to develop management, communication, and decision-making skills, for example. The role of management during empowerment is preparing the workforce and lowering the number of managers. Empowered employees connect with customers. Customer service and product development begin with people who actually do the work. The power to “sign-off” on decisions reflects ultimate power. Others are advisers or puppets. Empowerment, realistically, is a dance of shared power. One time you lead; another they. The most important aspect of empowerment is the negotiation between equals regarding who has power in any given circumstance. 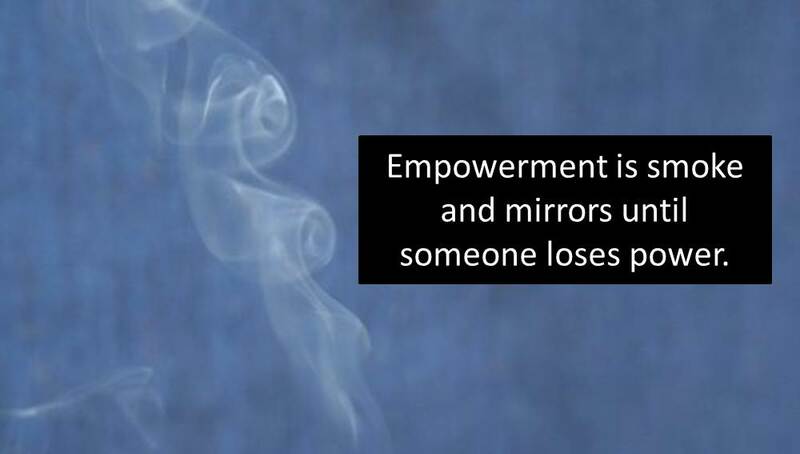 How is empowerment being fleshed out in your organization? This entire post is inspired by, “Stewardship: Choosing Service Over Self-Interest,” by Peter Block. Peter’s book is highly recommended, but not for the faint of heart. Empowerment – what a powerful and engaging word. It speaks volumes – and too often under delivers. We often feel empowered, yet come across powerless, which ultimately leads to frustration. The gap between empowered vs. powerless might lead to disenchantment. Which leads to the ultimate question – do you accept or not? If you accept, how do you deal with it – because everyone’s story is different. Personally, I simply decide it may not be worth the fight and move on. Do you accept empowerment? Now that’s an interesting question. It makes me think about courage, organizational culture and what happens when people make mistakes, and taking responsibility. Thanks! You are absolutely right about feeling empowered wherein we are still powerless. I have been in organizations were they preach equality among members, but whenever one comes up with a good decision that will benefit the whole group, if executive board members are not onboard, the good idea would die in the embryo. Organizations will always need leaders, they may not need so many managers. I have noticed that the workforce has a lot of “management” these days that seems to do nothing but handle decisions but don’t really lead. Project managers, product managers, account managers, customer managers, etc. Everyone is a manager and no one is leading. The best manager I ever had was the one willing to admit he didn’t know everything. I’ve followed that model and basically told my people time and again “You have knowledge and expertise I don’t. I trust your judgement.” That has led to some uncomfortable situations as I’ve had to go to bat for someone when they were wrong. I told them I would back them and they made a mistake. I think this is where empowerment weakens. It’s not just about reducing managers power, it’s also forcing them to get out of their comfort zone. However, I don’t have to manage my team all that much. I do have regular day-to-day activities, but I get to be involved more on the strategic side, and I coordinate with other directors and senior managers. Allowing my managers and my senior employees to apply their expertise without my direct intervention has freed up my time to be involved with a broader view of the organization, which has led to some improvements that have needed to be tackled since before I arrived. Thanks Rob. YOur insights are valuable because they feel like they come from real life. Warren Bennis said, Failing organizations are usually over-managed and under-led. Thanks for bringing out an important sticking point. Who takes the blame…I wonder if those who are empowered get to enjoy both the up and down side of empowerment. Having managers and leaders take the blame might be an expression of disempowerment. Perhaps the real issue isn’t who takes the blame but what happens when mistakes are made… why blame at all? Could it be, What did we learn? Of course the issue of repeated failure comes up…that’s a different story that may involve reassignement, retraining, in extreme cases, dismissal. There have been occasions where upper management found out that a mistake was made because one of my subordinates made a decision and then acted on it without necessarily checking with me first. This is where the rubber meets the road. Do you stick with your own decision to empower the employee or do you throw them under the bus? No one has ever been fired over this. The conversation is uncomfortable but usually easy. I typically can get upper management to agree with me on the employee’s expertise and once we have that understanding it is easy to demonstrate why I allowed them to make the call. However, most managers I know run from this situation at all cost. The idea of being in trouble over a subordinate’s decision is too much for them. As you said, empowerment is a loss of power for the manager. A loss of control. Management is all about control. Leaders can give up control because if the direction is clear and the team is motivated they will follow. Management cannot give up that control because they really will cease to have purpose. Thus you have a clear delineation between management and leadership. Empowerment in my organization is done more to please some. It seems that we receive power to make decisions unless those decisions don’t jive with what the supervisor want us to do. You’re nailing the hypocrisy of phony empowerment programs. “Empowerment” as described seems quite similar to true democracy. Majority rules, and all that. I wonder if empowerment would eventually lead down the same path as democracy. What if your empowered work-group decides that, say, everyone should get a raise even though the business cannot afford it in the long-run? Point being, the empowered work-force will suffer the same faults as the leader that is interested in self-preservation versus the preservation of the group overall. That is not a leader fault, it is a human fault. Thanks MJ. Empowering the workforce assumes they are capable to handle empowerment. YOu suggest that not everyone is capable… I Concur. We don’t let babies play with knives. Good morning Dan. My employer promote’s the Empowerment Movement.However< I have yet tyo see an 'honest' commitment to giving up, or, delagating decision making authority to subordinates. Frequently, those who work where (the rubber meets the road), are the ones with authentic solutions. Are we involved in the decision making process? In a way we are, but at times, I am left with the perception that this is merely, 'window dressing'. Managers and supervisors are reluctant to share decision making authority for fear of losing 'thier power position'. Real Empowerment is ALL ABOUT sharing. Sharing infromation and fact's, sharing solutuons to problems, and most importantly, sharing decision making authority. It's give and take from all sides. With a new department leader, I see our Empowerment program making a positive turn. We're not there yet. But we ARE moving in the rite direction. "Thanks again Dan as each time I raed your blog I feel a bit more empowered"! I’m familiar with your context and share the same assessment. It seems that things are moving toward empowerment. With nearly 20,000 employees, it will be a slow journey! I know you are part of that process… keep the faith! My experience is demmings went to Japan and empowered the lowest dudes and dudess’s on the assembly line. Empowering them did Japan pretty pretty good. Got to go with Demmings on the empowerment thingy. Think Toyota, Honda, Mitsubishi, and Sony do too. Just figure out how he did it and copy him and not try splitting hairs on the way to define empowerment. Just a suggestion. Two flocks of geese, one in Canada, one just over the line in US. Both decide same time same decision time to fly south, both arrive in Florida same time. Two different groups, same decision, same time, same result. Connect with Why and everyone joined together confidently marching in lockstep towards a shared agreed upon goal! Everyone fulfilled and inspired in the process. Check out Barry Wehmiller to see what that looks like in action. I’m all for empowerment. What makes you think I’m against it? What it sounded like is you are not a big fan of people doing whatever they are doing and calling it empowerment. Actually doing it means people congruent inside and out and why’s clearly defined and joined at the limbic portion of the grey matter!!! Empowerment in the workplace only works like it does in life and that is exactly when we are willing to give up some of our power so that others can truly utilize theirs. It’s the same in the for profit as it is in the not-for-profit and political arenas. The problem is, how much are we actually willing to give up and how much of leadership in the workplace or life is actually about power? I would think it is more about influence which may be intermingled with power but not necessarily the same. The perception of power can hold someone in a leadership position for so long but without influence they will not stay there. Of course, the difference can be who is being influenced and who is doing the influencing…Also of course, if we don’t see others as equals, we will never be able to empower them. How we define “equal” goes a long way. There is definitely a difference between authority and influence. Plenty of managers are willing to use authority, not many are willing to use influence. I work in a knowledge industry. Authority is great if I was in charge of an assembly line producing widgets. Since I work with people who have to think about solving problems, authority is not as useful. They need to be motivated and engaged in order to be effective. Influence is a better tool. Influence is scary to traditional top-down managers because ANYONE can have influence. The receptionist who works at the company for 20 years and knows everyone may have a ton of influence. A brand new manager may have very little and doesn’t know how to build it. I think that is why so many fall back into the traditional model of authority. It is easier to give orders than build the necessary rapport to have influence over others. Exactly Rob, if you work in an organization that is primarily concerned about production authority can push for a while but is still limited. In other organizations, like sales, influence has a much more direct active affect. I work for a small NGO and whether I am meeting with high profile politicians or the poorest of villagers, it is influence that is going to make a lasting change. With one I have NO authority, with the other I have quite a bit depending on the situation. But, with both, if I can’t influence them how will I ever change behavior for a longer lasting positive change? NGO’s, mainly smaller ones, work through relationship and networks and it is their influence that matters, not their authority. For that to work we always have to show mutual respect and be willing to give and take and let others in on the planning and decision making from the start. Then we have to follow through with our promises to them as we help hold them accountable for their promises to us. THAT, is the only way empowerment works. Organizations that are built on money making and productivity have built in systems that make this difficult but not impossible. You may need to hire an organ player, Dan. I sometimes feel funny “amen”ing without accompaniment. This is a powerful call to true empowerment. Empowerment “doesn’t work” because we simply too often aren’t committed to its success. A truly empowered team means that the “leader” moniker must be more fluid. I’ve been on the receiving end of the faux empowerment that you mention. Faking empowerment locks away the potential of your team. The HARD truth of your post is the statement – Empowering another is losing your power” . Its easy to read over that brief statement and just nod the head in manager-esque agreement. But empowerment only works, as your post says, when the holders of power, relinquish it. I am re-reading a brilliant little book called “The Nibble Theory” by Kaleel Jamison that very simply tells the story of helping others to grow by sharing your resources (knowledge, experience and power) rather than withholding those things. This whole idea requires courage or as you said Dan its just manipulation. Thanks for this! Interesting post Dan- I think you are right on. Leadership is about expanding horizons and capabilities- setting everyones sights on a shared vision.. cultivating what might be.. Thanks for another thought-provoking post! Love your comparisons on managing vs leading. With your permission I might “borrow” those……. Thank you- please feel free to borrow and even make it your own! I should add, or qualify that I believe the shifting of control should be done gradually, with guidance, coaching and support..and should increase over time, in proportion to the individual’s growing judgement and demonstrated capabilities.. Agreed Lori!! creating empowered people is a growing process and not a declarative process. Too much too fast and people could very easily be hurt, the organization could be impacted and everyone watching may take their chips off the table. Good responce Lori. Real Empowerment of employees can be, no, (should be) a long deliberate learning process. Not everyone in your organization ‘wants’ decision making authority. And quite honestly, every orfganization has employees with a proven track record that should ‘restrict’ them from particapating. “Empowerment is about doing what you can to make things better and more efficiant, ‘not’ being a thorn in the side of those who are fighting the good fight. A really insightful post about empowerment. I agree that when managers control information, empowerment will not take place. I also agree that transparency is required to empower. My research in banking industry reveals that top management talks about empowerment but line management do not feel so. Top management always speak convincing but middle and line managers always have grudge against management. And why this happen depends upon previous trend set by management. For example, top management has practice of oral instruction to line managers. But they always talk about following rules. What happens in practice is that when line managers talk about rules when top management instructs orally, top management intimidate. When they instruct orally, weather it is right or wrong, it is expected that line managers should follow it without question. Secondly, when union talks about welfare of employees, they do not do so in practices.They are more interested in protecting their interest. And interestingly, top management and union always look convincing and speak favorably about helping employees.However, employees feel opposite. So, to make empowerment process effective, it is important to disseminate same information and act accordingly in the system. Great post. I think the way I have phrased this in the past is that I want to make my job (as most companies will define it) obsolete. I want others to be making the decisions while I help give them the tools to keep making a difference. Then I can move on to the next challenge confident that I have given my team what they need for autonomous success. Self-empowerment is possible. Creating an environment where someone chooses to be empowered is possible (although not all that common). But one person cannot empower someone else. Doc, I think I get your drift that you can lead a horse to water but you cant me it make a decision. I think the bigger idea at play here, for leaders is, that organizations bestow on managers a positional authority which includes decision making. Unless a leader is willing to surrender that power to a member of the team who is not positionally powerful you dont have empowerment in your team and most likely not in your organization. Doc, I can use enablement. The US military survives because we practice what is preached enablement. Oh, and by the way, what about your clients/customers? They are use to a way of being treated, communicated to, and serviced in a certain way. Think they don’t have a stake in your ’empowerment’ or lack thereof? Nice post. Ah, yes, empowerment. My candidate for the “corporate claptrap” word of the decade. It is not the equivalent to “enable”, for that requires commitment on the part of management to train those they wish to “empower” and we all know how much the corporate world loves to invest in training. Great post. Hi Dan. Interesting conversation. I must agree that the word empowerment is often mis-used, for example declared when it is not in fact present. However, I also think that when speaking of empowerment within an organization, we should think beyond the legalistic definition of official authority, and rather speak of the broader definition which speaks of enabling: equipping or supplying someone with an ability. Empowerment within an organization should be about enabling an individual to be successful at meeting their responsibilities, ie, get their job done. That certainly requires having the maximum appropriate (versus minimum necessary) decision making authority on issues affecting their work, and knowing what those boundaries are. But well beyond that element it includes ensuring that employees have the information, business alignment, training, materials and resources necessary to be successful. For example, an employee that clearly understands their objectives and how they connect to the business goals, and has the necessary authority to make decisions regarding their area of responsibility, but has a workload far beyond their ability to successfully execute, is not empowered. This is a situation with which far too many employees are familiar. Lisa I just don’t think it could’ve been said better. Your last two sentences sounds a lot like my employer, the Pa. Department of Corrections. I can’t help but think of what it’s like to be put in charge but to know that if you don’t do it the way the boss would and the outcome isn’t exactly what they want then it doesn’t go well. So instead of being your best you are trying to get in the other persons head to become their best. Never a win win proposition. I found this article weird and a little insulting. Empowerment comes in many forms and doesn’t preclude the need for management. And empowerment comes from an individual not to an individual from an organization and mostly it’s hardly a zero sum gain. In fact the more empowered employees are, the more capable an organization becomes. Lots of good stuff. Now for my slight non-concurrence. The US Army leadership teaches empowerment in all the professional education courses. It is the effective use of the skill in both knowing how to and in knowing how to Implement that makes our forces victorious in combat. It is the correct use and support of enablement that allows a Sargent to lead their squad in remote sites for extended patrols. This is while there is no doubt who the Commander is. For those who do not have a military background, the Commander is not the Sargent. The Sargent is enabled to make life & death calls. Enablement does not require 2 equals, nor reciprocity.